Following their latest nominee for "most-disappointing loss of the season," the Los Angeles Lakers found themselves looking for leadership. Someone to rally around and maybe change the direction this season is heading. In stepped LeBron James. "You either make it or you do not make it. That's when you worry about it. " Well, surely not all of the postgame scrum was that bad, right? "You've got to decompress and get away from the game … Get fresh, get your mind right, get your body right and come back with the right mindset to make the playoffs. " Okay at least that was closer. Honestly, given the type of effort he gave for most of the Tuesday night's loss to Atlanta Hawks, it was pretty fitting that he half-assed the postgame scrum other than that final quote. myself and others covering the team included) desperately needs the next week or so off. 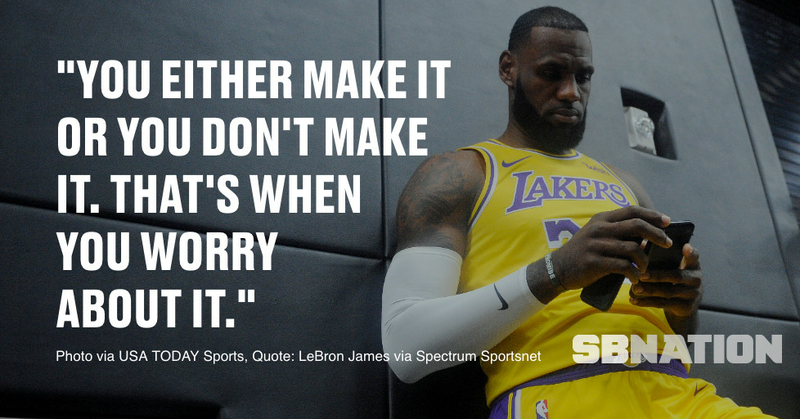 The Lakers are limping into the weekend and they have to be ready to hit the sprint button as soon as they get back, as they find themselves two and a half games of a couple of hungry teams hoping to keep them out of the postseason. Now, whether the locker room they all come back to looks like the one heading to that break is another thing altogether, but LeBron's comments do serve a purpose: They highlight how the taxing of the last few weeks have been with everything seeming to come it's breaking point Tuesday night in Atlanta.
] or Google Podcasts .